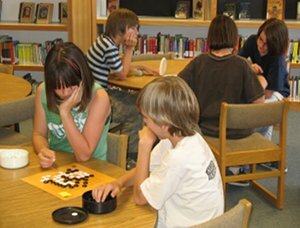 After nine weeks studying Go, practicing Go and solving problems, students at Dixon Elementary School finished up the 2011 Spring Semester with a knock-out tournament. Everyone who participated received a copy of The Way to Go and the top three players: 1st-Liam, 2nd-Brooklyn and 3rd-Emmett received a copy of Peter Shotwell’s Go! More Than a Game. Peter’s book was chosen as an excellent basis for building skills as well as providing concise discussions on Go history and culture. The awards were presented at the school’s Awards Day, May 29th, attended by students, teachers and parents. The class was run by Santa Fe Go Club member Robert Cordingley and we are much indebted to the school librarian, Ms. Maggie Durham for championing Go in the school’s art program. Thanks also go to the school staff for their support, particularly Head Teacher Ms. Kiva Duckworth-Moulton and the AGF for their help with equipment and materials.